As Iran seethes from protests over its disputed presidential election, a new museum exhibit in New York explores an aspect of Iranian culture that’s just as rebellious: its contemporary art. “Iran Inside Out,” which opens June 26 at the Chelsea Art Museum, offers a sweeping survey of new work by more than 50 Iranian artists, most still in Iran. A new generation of Iranians is attracting the art world’s attention in part because of its eagerness to confront once-taboo topics like political and sexual freedom. Newsha Tavakolian’s photographs in the exhibit chronicle the life of a transvestite living in Tehran. Nicky Nodjoumi, who lives in Brooklyn, paints coy images of Iranian religious leaders dallying with naked women. Even Mehdi Farhadian’s tranquil painting of a female soccer team is loaded since, until recently, women were not allowed to attend soccer matches in Iran. “People who think Iranian art is all veils and calligraphy are missing out on some really fresh work,” says co-curator Sam Bardaouil. Lately, a conglomeration of factors has nurtured the Iranian art scene, from the boom-era prices paid for stars lie Shirin Neshat and Farhad Moshiri to the growth of edgy galleries in Tehran like Aaran Art Gallery. The art scene in Tehran can be volatile. Aaran’s owner, Nazila Noebashari, says she keeps her artists’ controversial works in her gallery’s backroom where censors won’t spot them, including Jinoos Taghizadeh’s fake stamp depicting a woman being stoned. What would happen if that stamp were publicly displayed? “Jail, at best,” Ms. Noebashari says. Expatriate artsits are also making potent work. 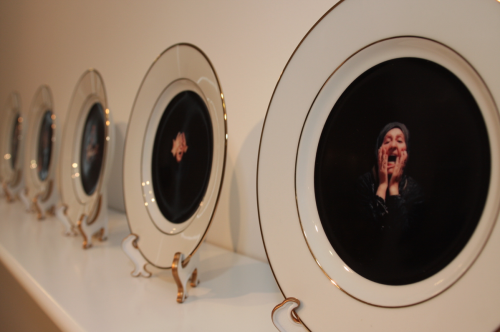 earlier this year, Abou Farman and his creative partner Leonor Caraballo, who is from Argentina, created “The Heirloom Plates Series,” seen above. Instead of commemorating happy milestones, their ceramic plates capture grieving people in moments of war and natural disaster. Mr. Baraouil says he’s been trying to check up on the dealers and artists in his show who are in Tehran, site of most of the political rallies protesting Mahmoud Ahmadinejad’s re- election last Friday. Phone lines have been disrupted, and he hasn’t heard from everyone.